In last months’ article, we covered research and tag application strategies to get the first time hunter prepared for successfully drawing a Wyoming pronghorn tag without the benefit of preference point accumulation through the states limited draw system. Wyoming does have a Leftover License Draw as well. The application for that draw is in late June after tags have been allotted from the initial draw. We are not going to cover the Leftover License Draw in this series, as it could easily be a topic on its own. Plus, using the information from Part 1, I'm hoping you'll have drawn a tag by that time anyway. Now that you’ve drawn your tag, you need to have the appropriate equipment to get you into the field and a plan to keep you there until you fill your tag. The good news is, if you are an eastern-based whitetail hunter, you've probably got most everything you need in terms of gear. First, let's talk about rifle selection. Over the years my hunting partners and I have used .243, .25-06, .270 and .308 cartridges, all to great success. 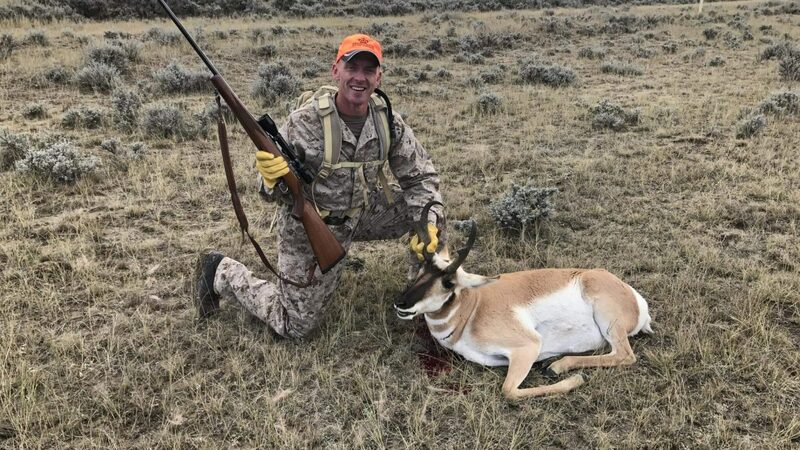 Antelope don't require the heavy knockdown power of an elk rifle, so having "too much rifle" is a very real consideration when hunting pronghorn. Although the .25-06 is my personal favorite, most any big game rife you are confident shooting out to 300 yards will do. I would also recommend a bipod or set of shooting sticks. Maybe even both. My first year hunting I had neither and was unable to set up for a good shot above some tall sage at a very nice buck. You may hear hunters talk about having to be a +500-yard shooter for pronghorn, but that is more a representation of today's long-range shooting trend than representative of the conditions you will face while hunting. Of the 5 pronghorn we have brought back from Wyoming, only one was shot at a distance greater than 300 yards. The others were all in the 200 to 250-yard range. Next to your rife, the most important piece of equipment is a good pair of boots. You will absolutely need to have a good pair of hiking capable hunting boots if you plan to range more than a few hundred yards from your truck. If you do get boots specifically for this trip, take the time to break them in thoroughly prior to the hunt. I like to put 20-30 miles on a new pair before actually hunting in them. If you are in an area with highly fragmented public land, having a GPS unit or navigation app like onX that you can use through a smart phone is essential. You will have instant visibility to the locations you plotted out back home, a Birdseye few of the landscape through topographic map layers and aerial photography, water locations, road designations, etc. Most importantly, a GPS unit showing property ownership will give you the confidence that you are hunting within the boundaries that you are legally allowed to hunt in. Case in point; in 2016 I shot my first pronghorn buck no more than 20 yards from the fence line separating public from private land. Without my GPS device, I wouldn't have been 100% confident that I was legally allowed to do so. You'll also need a pack. Given the relatively small size of even a large pronghorn buck when compared to a whitetail, a large daypack or medium backcountry pack should be all you need. I pack out pronghorn in one trip, using a 3900 cubic inch internal frame hiking backpack, to include boned in quarters, ½ cape and skull. Your pack will be largely empty until you need to fill it with pronghorn meat, but prior to that, I carry my kill kit, first aid kit, a couple of bottles of water, some food to get me through the day and wet weather gear. It works out to less than 20 pounds. You'll be eyeballing a lot of country on your hunt either from the truck or while on foot, and a good set of optics is recommended. If you have to choose between binoculars or a spotting scope, I would go with the binoculars. Pronghorn have vision comparable to a human with 8-power binoculars, so having a good set can help even the playing field a bit. For clothing, Wyoming requires at least one piece of blaze orange be worn on the upper body. This usually works out to a hunting vest, hat or combination of both. Any camo you might wear during your whitetail hunts will work as well, although outwear of simple earth tones like tan, brown and light green might be even better as tree stand hunting camo patterns often appear as quite dark on the backdrop of the plains. You'll also need a place to stay. Wyoming does not allow for dispersed camping on state lands, but there is usually an abundance of BLM or Forest Service lands nearby that do. Just make sure you understand the rules for your area before you throw up a tent. Truthfully though, we have yet to hunt pronghorn out of a camp, mainly because my hunting partner (my dad) hates camping. We've always managed to find affordable hotels within 45 minutes of our hunting areas. Wyoming is a very hunter friendly state and our hotel stays have always been pleasant. A hot shower, cold drink and a crockpot of chili is a nice bonus after a long day hiking across the sage. Once you get into the field you'll likely see no shortage of pronghorn, they seem to be everywhere. The trick is finding them on land that you have access to. In an easy to draw unit, you are more likely to have access to much smaller and more broken up landscape to hunt on than open expanses of accessible land. Think clusters of 40-640 acre parcels. Our first day in the field is largely spent in the truck, driving to the handful of areas we've identified during our map research. We hit as many spots as we can to locate pronghorn, verify access and gauge hunting pressure. While the day is largely meant as a reconnaissance to ground truth your map research, have your rifle ready. The pronghorn you are looking for may just be waiting for you at your first stop. After spending the first day figuring out your surroundings, you should be able to narrow your potential hunting locations down to just a few that you feel will offer the best chance at filling your tag. On the following days, focus on these 2-3 locations, glassing from the truck and hiking farther in to locate antelope that are not visible from the road. Spend some time in these areas to get a feel for the landscape and be ready to act when you locate animals. Conversely, don't camp out in one area, praying for antelope that will never show. Pronghorn might be the fastest land animal on the continent, but they are also known to stick to pretty small home ranges. If you can't locate them in or around the area you can hunt, go check out another spot. Many including myself find antelope to be some of the tastiest wild game meat out there, but for some reason, I do hear about the occasional detractors. I think this boils down to a combination of two things; poor field care of the carcass and poor preparation in the kitchen. To the first point, this is because some eastern hunters treat pronghorn in much the same way they treat whitetail; gutted, dragged, and tossed in the truck bed before heading back into town. For reasons unknown to me, antelope meat does not seem to tolerate that kind of treatment as well as whitetail. Because of this, when we have a pronghorn down, we cape and quarter the animal immediately. I don't care if it died in the shade of my Dodge truck, it's getting cut up on the spot. We brake the animal down into quarters, with each quarter getting placed into a synthetic game bag. If possible, we hang the bags from a tree, or more often on the plains, a fence post to cool. In another bag goes the backstraps, trimmings and bone-in neck roast. Keeping a neck bone-in might seem risky to eastern deer hunters with CWD on the mind, but pronghorn have not been found to be a carrier, and a bone-in neck roast braised in red wine and root vegetables is one of the best dishes you will have all year. Trust me, do not grind it up for burger. If you've never processed a big game animal in the field, watch some videos online. Both Randy Newberg of Fresh Tracks with Randy Newberg and Tim Burnett of Solo Hunter have excellent videos on YouTube showing how to cape and quarter pronghorn in the field. Back at the truck, the meat goes into large ice-packed coolers. We tend to keep a couple of 60-quart Yeti type coolers packed with ice, as they will keep frozen for several days. When we have pronghorn meat that needs to be cooled down, we transfer some of the ice, along with the meat into a large, 120-quart Igloo Polar Cooler. For my friends not used to the English system of measurement, that works out to a cooler that can hold 188 beer cans. This huge cooler can be bought for less than $100.00 online, keeps ice fairly well, drains easily and can hold an entire pronghorn including cape and skull. Once full, the cooler stays back at camp or the hotel and we change the ice out every other day or so. Driving home in a truck heavy with chilled pronghorn meat is a good feeling. Wyoming's application deadline for antelope is May 31. Get a tag and get after it.